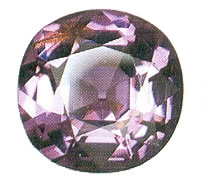 Although spinel comes in red, pink, blue, violet, and brown only the red and pink spinel is most often used for therapeutic purpose. Red spinel has often been confused with ruby, because they are similar in color and brilliance. Spinel is a magnesium aluminium oxide with a hardness of 8 and an isometric crystalline structure. Red spinel, with its fiery energy, inspires you to finish projects you have started. It diminishes timidity and reluctance and increases willingness and confidence on your dealings.